Jobu Reviews the Yankees’ series loss to the Oakland A’s. Normally, when you play Oakland, you feel pretty ok about your chances. The way the A’s have been playing in the last couple of weeks though, I knew this was going to be a tough series for the Yankees to win. Oakland was really the only team hotter than the Yankees in the last two weeks, going 12-2 in their last fourteen games coming into the series. One hot team got the better of another in one of the more highly contested four-game sweeps you’ll ever see. 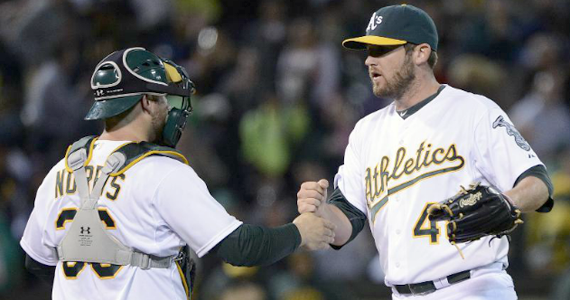 Oakland avenged the sweep the Yankees put on them the last time they were in town. It happens. This was a bit of a tough game for the Yankees, mostly because they didn’t get a day off to travel from New York (where they had just swept the Blue Jays) to Oakland. At least they got to play a day game and fly out somewhat early in the day. No excuses though, as the A’s jumped out on top early on Freddy García, and AJ Griffin made sure they stayed there. The Yankees got a late home run to extend the near-record run the offense is on (three or more runs in now 43 straight games, just six behind the record), but it wasn’t enough and the Yankees failed to fire the opening salvo we love so much at Jobu’s Rum. At least Josh Reddick didn’t hit a home run. As hard as García battled in this game, I think all that happened was that David Phelps proved he deserves the fifth spot in this rotation. 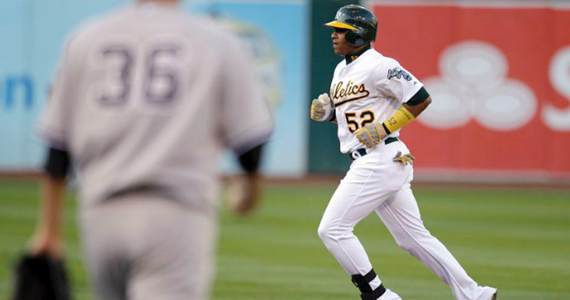 García got off to a shaky start as the A’s jumped out on top with an infield single by Jemile Weeks and an absolute bomb on a hanging curveball to Yoenis Céspedes. When you throw slop, you can’t miss location, and Céspedes hurt Freddy really badly for it. In the third inning, the A’s scored two more runs when Freddy left a pitch over the plate with the bases loaded and two outs, and Seth Smith slapped it into center field to score Coco Crisp and Weeks. That was all for the A’s scoring, but let’s face it: Freddy was in trouble all game. His final line looked like this: 5.2 Ip, 9 H, 4 R, 2 BB, 6 Ks, 105 pitches and his third loss of the year (4-3). While Freddy wasn’t terrible, he was completely outshined by Phelps. Phelpsy, who joined the team after the victory against Toronto (probably in case García got ripped), came into the game in the bottom of the sixth, after García gave up a two-out single to Crisp. Not only did Phelps finish out the sixth, he also pitched scoreless seventh an eighth innings to boot. In all, the kid’s line looked like this: 2.1 Ip, 0 H, 0 R, 0 BBs, 4 Ks, and 27 (27!) pitches. He kept the Yankees in a low scoring game, which is all the offense usually needs to have a chance to come back. The Yankees need to figure out if they are better off Having Phelps anywhere from one-to-three innings per game (Girardi has discussed using Phelps in more important roles and not just as a long man), or for five, six or seven innings per game… I think the bullpen is good enough that Phelps should be given Freddy’s spot in the rotation, although I will admit that, when he has started, he’s struggled with pitch counts. Either way, I see David Phelps having a huge impact on the success of this team, no matter where he pitches. The Yankees had never faced AJ Griffin before, so right away there was like a 75% chance that he would dominate them, and his 2.63 ERA coming into the game really had nothing to do with those odds. The Yankees struggle against new pitchers. That’s baseball, Suzyn. In the first, it seemed like they were going to break him early. Derek Jeter led off with a single and, after Curtis Granderson flew out, Alex Rodríguez singled Jeter to second base. This is when things got wacky. Robinson Canó smoked a liner to left that was clearly caught by Céspedes. He then took the ball out of his glove and dropped it as A-Rod and Jeter scrambled back to first base. Instead, the umpire called it a non-catch, which would have been a huge break for the Yankees, if A-Rod and Jeter hadn’t retreated after the obvious catch. The A’s ended up almost getting a double play, but only nabbed Jeter at third on the force (everybody got that?… Good). Mark Teixeira came up next and smoked a ball directly into the shift, and the inning was over. Griffin really settled down after that, scattering five more singles over the other five innings he pitched. The Yankees finally got to him enough to make things interesting in the sixth, when, after singles by Jeter, A-Rod and Canó loaded the bases, Tex (shouldn’t that technically be “Teix”?) hit a sacrifice fly and Nick Swisher singled in another run. Griffin ended up getting out of the inning though, and the bullpen pretty much shut them down in the seventh and eighth. Ryan Cook came in to close things out in the ninth and, despite allowing a solo home run to Swisher, finished the Yankees off for his tenth save of the year. Another game, another competitive, close loss for the Yankees. The A’s got another great pitching outing from a youngster (Tommy Milone), the Yankees bats stayed dormant and that’s a recipe for a Yankees loss. It was their second in a row and it also stopped their 43-game streak of scoring three or more runs in a game (2nd best all-time). The two runs of offense the Yankees mustered wasn’t enough for Iván Nova, who took a tough loss. Nova’s final line might look like he had a very good start, but he really was let off the hook by the A’s batters. Iván put ten men on base (11 if you count his error), including six extra-base hits, but the A’s went 3-14 with RISP which kept Nova’s ERA down and gave the Yankees a chance to win this game. He really was dancing in and out of trouble the entire game, but that showed his resolve. Anyway, despite all of the base runners, Nova’s line looked like this: 6.2 Ip, 9 H, 2 R, 1 BB, 6 K, 107 pitches and a no-decision. Boone Logan finished the seventh inning, David Robertson pitched a scoreless eighth and Clay Rapada got the first out of the ninth before Cody Eppley came in and blew it all up. Eppley faced three hitters (Céspedes, Jonny Gomes and Brandon Moss), allowing singles to all three, including the walk-off to Moss. Eppley has been so good this year that he was bound to have a stinker, so hopefully that’ll be it for a while. You know what they say about church mice… so quiet. Milone struck out ten Yankees in his seven shutout innings, so there really isn’t much for me to talk about here. It was only when the A’s went to the bullpen that the Yankees were finally able to get on the board. Russell Martin (still only hitting .182 after this game), hit his tenth homer of the season to lead off the bottom of the eighth to make things 2-1, and then Canó tied things up by leading off the top of the ninth with a home run off of Cook, and that was it. The slump continued, and the Yankees lost. I’m basically writing the same summary for every game and changing the names of the players involved, and it’s not a lot of fun. The Yankees offensive slump continued in game three of the series, as they wasted yet another good pitching performance in a close loss. The Yankees sent Phil Hughes to the mound to face A’s rookie Jarrod Parker in what ended up being a very good pitcher’s duel. Alas, the A’s got another late win though and Hughes took the tough L.
Hughes hasn’t pitched too many games that were better than the one he pitched in game three. He basically made two mistakes all night, and they were both hit out of the ballpark. They say that if you can keep your home runs allowed to solos you’ll be ok, but Hughes did that and still got the L, so it really was just a bad luck, no run support game for him. The two A’s runs came on a solo home run by Céspedes in the bottom of the fourth (boy did that guy have himself a series) and another solo home run by Inge in the bottom of the eighth. Hughes did give up two homers, but if you go out there and give up two runs, you had yourself a good night. His final line looked like this: 7.2 Ip, 4 H, 2 R, 2 BBs, 6 Ks, 117 pitches and his eighth loss of the season (9-8). These paragraphs get shorter and shorter, don’t they? After scoring three runs in the first game and two in the second, the Yankees only managed one run in the third game of the series. It came in the top of the fourth inning when Raúl Ibañez came through with a two-out single that scored A-Rod. That was it for the Yankees offense for the entire game. The Yankees didn’t even really have that many chances, but only went 1-6 with RISP, which hurts in close games. Game four was pretty key for the Yankees. 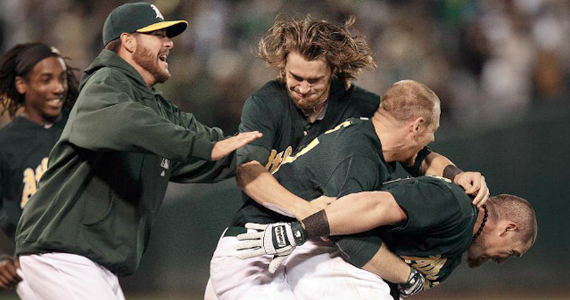 You don’t want to get swept in Oakland, I don’t care how well they have been playing of late. They really needed their ace, CC Sabathia to step up and stop the losing streak. Sabathia was facing our old friend Bartolo Colón. The Yankees jumped out in front early, but were unable to hold the lead as Oakland came back from a 4-0 deficit to force extra innings. 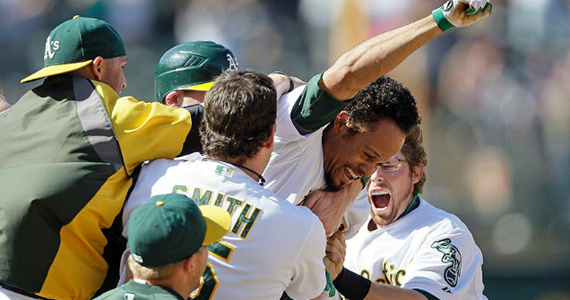 In the end, the A’s pulled out another walk-off win in the bottom of the twelfth to gain a sweep of the Yankees. Pretty terrible. Don’t get me wrong, CC pitched very well in this game at times. At other times, like he did a lot in the first half, he seemed to lose his concentration against weak hitters. He allowed solo home runs to Brandon Inge (.199 before that at bat) and Kurt Suzuki, who came into the game with no home runs on the year. Kind of unacceptable for a guy as good as Sabathia, but what can you do? At the end of the day, his line looked like this: 7Ip, 6 H, 3 R, 1 BB, 6 Ks, 98 pitches and another no-decision. It’s not the worst start anyone’s ever had, but he really needs to shut these weak hitting teams down, and he didn’t. The Yankees bullpen ultimately decided the outcome of this game. Robertson pitched a scoreless eighth, striking out Reddick and Céspedes in the process, but Rafael Soriano couldn’t nail it down in the ninth. Soriano made one bad pitch, a hanging slider to Smith, and it was hit over the center-field fence for a game-tying home run. It was just the second blown save of the season for Soriano, but it couldn’t have come at a worse time. In the extra innings, I think Girardi got a little too cute with the bullpen, mixing and matching with Phelps, Rapada and Eppley in less than three innings. I feel like, with the offense struggling in extra innings, you can’t burn through pitchers like that. Luckily for him, Eppley blew the game shortly after entering it by allowing the walk-off single to Crisp, so we didn’t have to worry about it. As I said earlier, the Yankees jumped out to a 4-0 lead early in this game. It looked like the game might get out of hand, or that the Yankees would at least cruise to an easy win. Their scoring came mostly in the top of the fourth, when Dewayne Wise, Chris Stewart, Granderson and Teixeira opened the frame with singles to put the Yankees up 1-0 with the bases loaded for A-Rod. A-Rod, who crushes Colón (22-50 with 8 HR coming into the game), laced a two-run double to the left-center field gap, and the Yankees had a 3-0 lead. In the top of the fourth, Granderson added to the lead with a solo home run, but that would be all for the Yankees. They failed to score in the next seven innings, even in the top of the twelfth when Teixiera led off by reaching second on a two-base error by Reddick in right field. A fly ball and two pop-ups later, the threat was over. 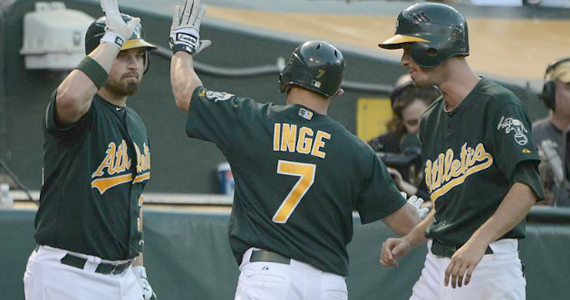 In the bottom of the inning, the A’s won. The end. We’ll get them next time, I guess. I don’t always do the final thoughts segment, but I felt the need to do so in this review because, as bad as it is to get swept by the A’s, this series wasn’t really that far away from being a four game sweep for the Yankees instead. They got three quality starts in the four games (even García’s non-QS wasn’t that bad), and overall pretty solid bullpen work if you don’t count Eppley’s two walk-off losses. The offense has been so good of late, that it was expected they go into a bit of a slump, and the A’s just outpitched them in the series. Plain and simple. Let’s not jump off a bridge quite yet, Yankees fans. We move on to Seattle tomorrow, which is an opportunity to get back into the winning ways we’ve come to enjoy this season.